Fryette FatBottom cabinets have been used on countless recordings and tours delivering tight focused power and consistent tone night after night. 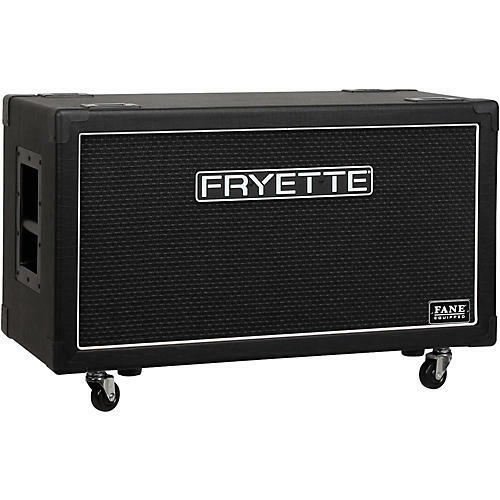 The 140W Fryette FatBottom FB212 is a low-profile straight 2 x 12 in. speaker cabinet with a vertical baffle, featuring Mono-Stereo input capability. Impedance is 8 ohm in mono mode and 16 ohm/channel in stereo mode. Plug-in casters included. FatBottom Series Speaker systems feature high-quality Baltic birch materials, manufactured on CNC (computer numerical control) cutting equipment for accurate assembly and bulletproof construction. Fryette's custom-built FANE F70G 12 in. speakers are front mounted for wide dispersion and excellent low-end control. Front mounting the speakers also allows for a well-sealed enclosure with virtually no air leaks, delivering extended projection and excellent power handling capacity. Dimensions: 29-3/4 in. x 14 in. x 16 in.